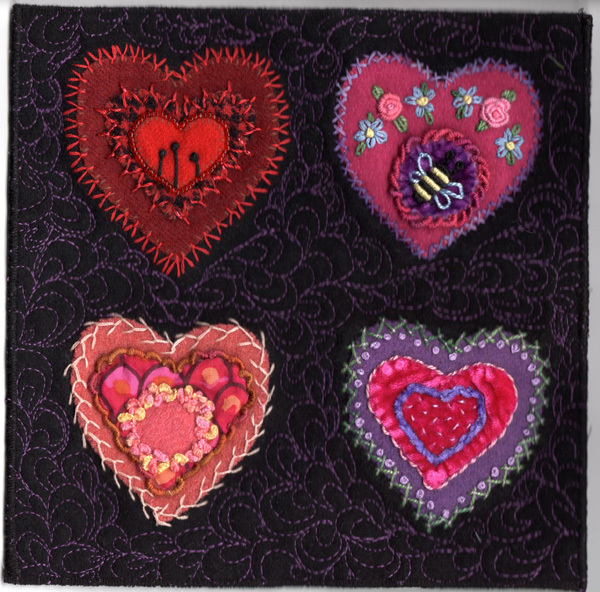 Technique of the Week #45 – Wool Applique – Cheryl Sleboda – Textiles. Technology. Texture. Teacher. Here’s another Technique of the Week that took a long time to execute. This is a wool applique technique that is all by hand (except for the machine quilting), and is actually very dimensional. This technique is taught by Sue Spargo, who came to speak and teach at our guild. I liked this as a project, but can see why larger works are so valued. This takes a long time to do! Not only do you applique the pieces down but then all the embroidery stitches add to the dimension and the time. Part of what takes so long is deciding which stitches to use, and what color threads. Your mileage may vary! 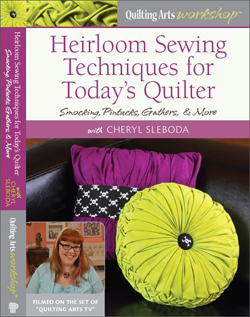 I did not buy Sue’s book in her class (it sold out), but I did download an embroidery stitch app on my iPad that was great called “Judith Baker Montano’s Embroidery and Crazy Quilt Stitch Guide” (Free with in app add-ons for $1.99). It has videos that you do not need an internet connection to watch, which meant on the road it was good to use where there was no wi-fi. In all, I was happy with the piece and the techniques, but I like handwork. Give it a try!